If you are lucky enough to live in the land where palm trees sway, then lush, tropical flowers will simply be out your front door, but for the rest of us, there are dendrobium orchids. Whether it’s for a graduation, a retirement, a welcome home or simply a party to welcome the coming of summer after a long, cold winter, a Hawaiian Luau just wouldn’t be complete with some flowers tucked behind the ears, strung around the neck or scattered in vases around tables. While tropical flowers actually do grow on trees in Hawaii, they can cost a pretty penny in more temperate climates. Temper the cost by choosing the wildly exotic, but extremely affordable dendrobium orchid. At an average of $2-$4 a stem, these beauties go a long way. With between 7-9 individual blooms per stem that can be removed and strung together or worn separately in the hair, each gracefully arching stem will provide ample amounts of the tropics. While most commonly found in white, the dendrobium orchid also comes in a bright fuchsia, a deep purple, soft lavender and orange. Typically, the lower flowers open first, with a few dainty buds on the top giving the whole stem a tapered appearance. These look amazing in a tall glass vase with rocks or clear marbles in the bottom. 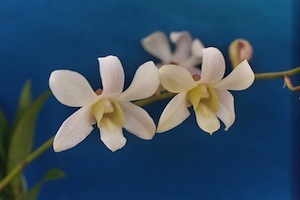 The individual dendrobium flowers are fleshy and turgid, with upright petals that won’t wilt for many hours after being removed from the stem. They will look fresh behind ears through many hulas and cocktails without being in water and will last for days if plucked and placed floating in a bowl or short vase. Dendrobiums are epiphytic orchids, meaning the plant grows hanging from trees or other structures rather than rooted in the ground like terrestrial orchid varieties. Most of the 1,200+ species are native to parts of southern Asia, though many are now commercially grown in Hawaii, which has become one the the largest commercial breeders of a wide variety of orchids worldwide. Traditionally, according to Hawaiian custom, it is the hibiscus flower that is worn behind the ear to advertise a woman’s eligibility (the left side means you are married, the right side says you are open to suitors), but the year-round availability of the dendrobium orchid make it an excellent substitute. Put a little hula in your step with these tropical flowers any time.